A woman hiding from Russian mafia as well as FBI, has to take some tough decisions as she falls in love with a police officer. 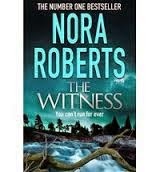 ‘The Witness’, by Nora Roberts, is a story of Abigail’s unusual upbringing, life threatening incidents and their resolution. The plot is highly engaging and fast paced, a hallmark of Nora Roberts novels, with an apt and riveting climax. Nora Roberts characterization of Abigail is unique and invokes sympathy as well as intrigue. Though Abigail’s logical text book dialogues sound like she is reciting instead of conversing, but they give her character credibility befitting her background and history. Her innocent and socially awkward interactions, particularly with Brooks, are endearing and humorous. Brooks, as hero, is perfect for romantic souls. Brooks family, more specifically his mother, adds right amount of spice to the narration. One thought that disturbs at times – if Abigail is hiding from the authorities and gangsters, why does she choose to show her weapons so openly? She wears a hip holster while talking to strangers and has a target practice area for shooting. About Author: Nora Roberts, as an author, doesn’t need an introduction. Still here are some snippets – She started writing almost 30 years ago and is one of the top writers of the decade. She has written over 200 books and numerous bestsellers. She also writes futuristic suspense series under the pseudonym J. D. Robb. Previous Post Wise Person in a Fool’s House!